Unique triple chime 8-day cable-driven movement. Brass tubes. 4/4 chime plays choice of Westminster, Whittington, or St. Michael. Automatic night shut-off . Silencing lever. Made in Germany. Dimensions: 63 x 23.5 x 10 inches. Made in Germany. 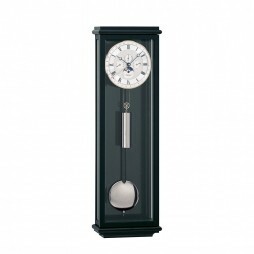 A perfect combination of classic and modern, this wrought iron wall clock includes a mechanical 8-day passing bell strike movement. Black and gold. Dimensions: 24-3/8 x 5-7/8 x 4 inches. Add a stunning visual ornate time piece to your favorite room that will ensure it stands out from all the rest with the Hermle Dartmouth 8-day Cable-driven Mechanical Regulator Wall Clock. 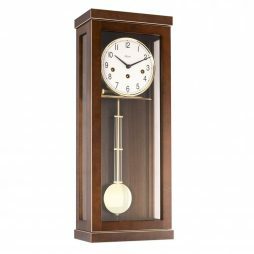 Its main features, a white clock face with a brass bezel, brass weights and a pendulum contrast perfectly with its highly polished brown case. This delightful household item also comes with an 8-day cable-driven movement, a 4/4 Westminster chime and an automatic night shut-off. 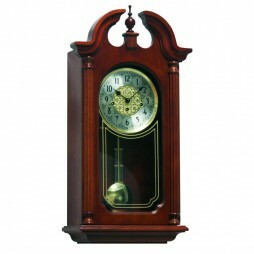 Add a hint of 19th century magic to your home with this classically styled wall clock. 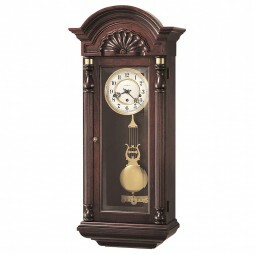 Its ornate case designed with a stylized finial comes in a deep red brown mahogany. 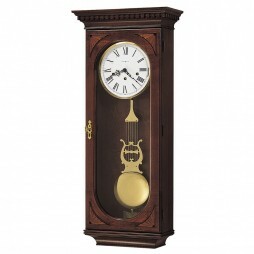 The case also features glass front and side panels through which the large dial with Roman numerals and decorative hands can be seen as well as a large brass pendulum. 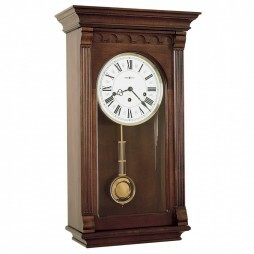 Additional features of the clock also include an 8-day 4/4 Westminster chime movement and a silencing lever. 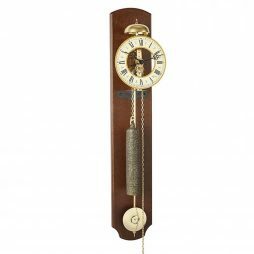 The Hummell Spring Wound Mechanical Wall Clock reminds us of Viennese tradition. 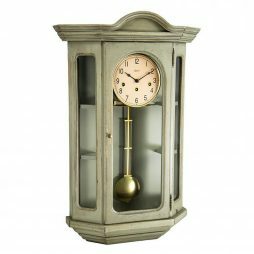 The simple and beautiful look of the clock will enhance the beauty of your house. The case and mechanism of the clock is German-made with 8-day, mechanical movement with Westminster chime. The designers have made sure to carve it an American or English regulator style, which provides it a unique and beautiful look. 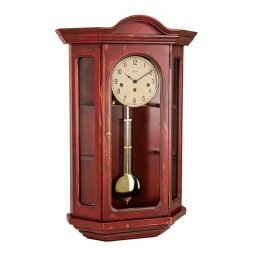 The clock is made of solid hardwoods with natural cherry finish that will add charm to your house. So, buy this amazing clock for your house today! 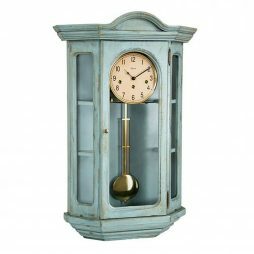 Add a unique character and charm to your home when you add this beautiful Howard Miller wall clock. Enjoy the beauty of its exquisite details from top to bottom. 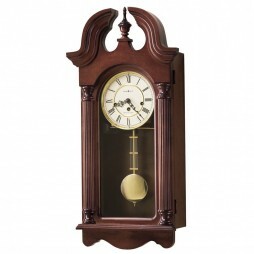 It's a beautiful wall clock that is made from select hardwood and veneers, with a nice Hampton Cherry finish. Carved acanthus leaf molding wrap around the pediment, while olive ash burl overlays frame the beautiful dial. 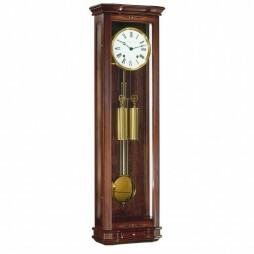 This elegant clock has a Westminster movement with a chime silent option. Complete with durable bronze bushing. It's a wall clock with exquisite design features you can't miss. 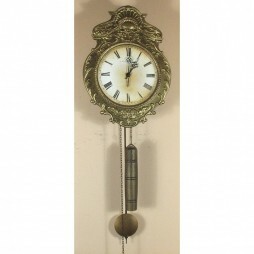 Create the look of elegance in your home with this extraordinary key-wound mechanical pendulum wall clock. 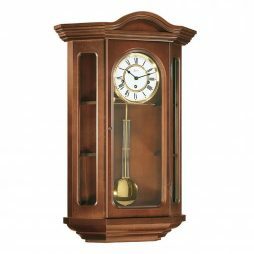 The Howard Miller Alcott features a beautifully sculptured cove and enlarged dentil molding; a Westminster chime movement with chime silence option and durable bronze bushing and is made with select hardwoods and veneers with a beautiful Windsor cherry finish. This beautifully decorative wall clock comes with an off-white Roman numeral dial that features a solid brass bezel and decorative accents between the numerals. 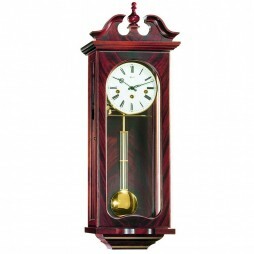 Upon buying this cherry finish wall clock you'll notice it's polished and raised brass pendulum with the grid, and polished chime rods that add a distinctive touch to the interior. 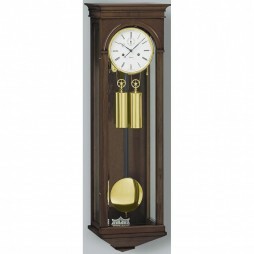 Bring an elegant touch to your home with this pendulum wall clock. Although the advent of digital technology may have made time pieces more accessible than ever before, wall clocks continue to remain as relevant as ever. No other piece of dcor is quite as able to provide the perfect combination of style and functionality as they are, particularly when they have been skillfully designed. 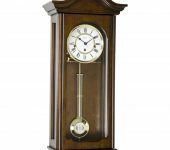 Like the Hermle Hopewell Chiming Wall Clock which has been created using select hardwoods and veneers featuring a swan neck pediment and turned finial. 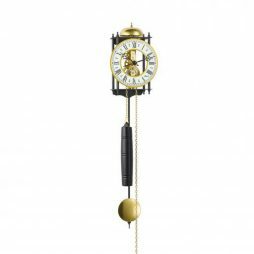 Fitted with a silk-screened glass through which its swinging pendulum can be seen, the wall clock also plays 4/4 Westminister chimes. 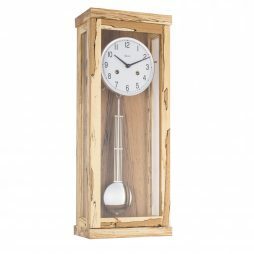 This is a beautifully designed and carefully crafted pendulum wall clock that is guaranteed to bring character to your home. 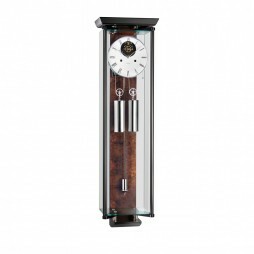 Beveled glass decorates the front door of this clocks, which goes well with its polished brass lyre pendulum that swings on a beat plate. A unique clock that features a highly polished Viennese dial that is overlaid with individual convex chapter rings and center disk; finalized with an enameled finish. 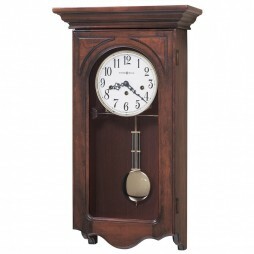 Upon buying this clock you'll notice it's Vintage Mahogany finished made on select high-quality hardwoods and veneers. This clock is key-wound with triple-chime Kieninger movement and plays a choice of Westminster, St. Michael,or Whittington 1/4, 1/2, and 3/4 chimes accordingly with full chime and strike on the hour. 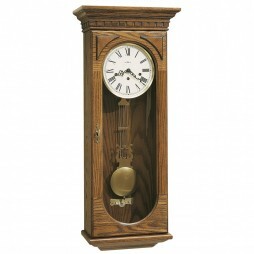 This chiming wall clock has an individually carved, scalloped shell on the pediment that is carefully designed similar to a John Goddard original. A unique piece of home decor you'll love to add to your wall. 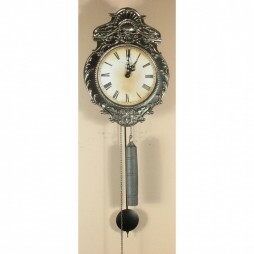 The Howard Miller Lewis, mechanical chiming wall clock will create a stunning statement with your walls and home décor. This is an elegant timepiece with an impressive design, made right in the US. 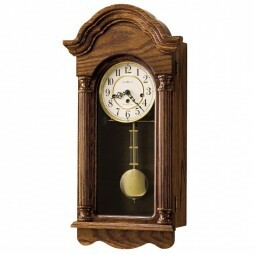 This clock was made with select hardwood and veneers with a Windsor cherry finish. It features a distinctive dentil molding on the profiled pediment with maple and ebony hand-rubbed marquetry overlays at each corner. Complete with its unique white dial that offers black roman numerals and serpentine hour and minute hands. The German Kieninger movement plays choice of Westminster, St. Michael, or Whittington 1/4, 1/2, and 3/4 chimes accordingly with full chime and strike on the hour. 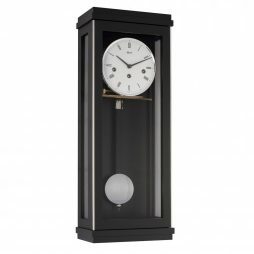 This beautiful clock will bring a distinct elegance to your home. 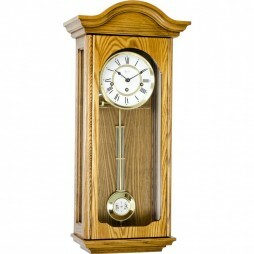 Enhance the look of your walls with an elegant touch with this captivating wall clock. 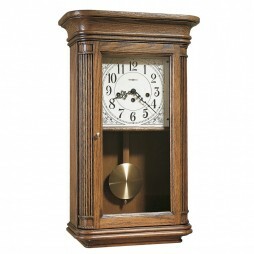 This key-wound clock is carefully made with select hardwoods and veneers with a nice Oak Yorkshire finish. The clock's off-white dial features Arabic numerals and floral-patterned corner accents. 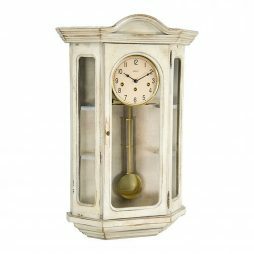 Upon buying this chiming clock, you'll notice its spun brass pendulum bob that appears behind the front-opening glass door with a polished brass door pull. Other features include a flared, molded bonnet and fully molded base. 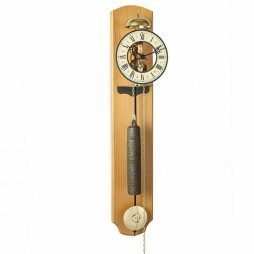 This Sandringham wall clock is key-wound, with a Westminster chime Kieninger movement that plays 1/4, 1/2, and 3/4 chimes accordingly with full chime and strike on the hour. 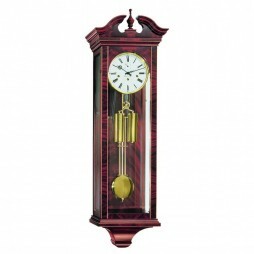 Designed and assembled in the US, this pendulum clock is ready to enhance the beauty of your walls. 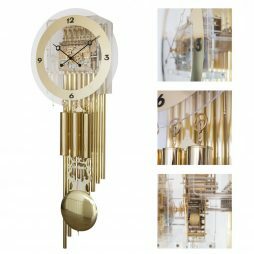 Beautiful details, and stunning features, this is truly the type of mechanical wall clock you need for your home or office. This lightly distressed clock has four carved overlays and a detailed molding above the dial; perfectly accenting the pediment and base of this Howard Miller wall clock. 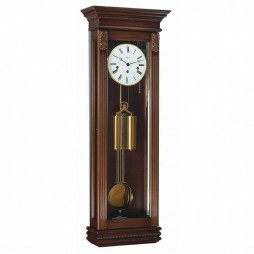 This mechanical clock features a soft, aged dial with an antique brushed brass-finished bezel. This elegant timepiece plays a beautiful Westminster chime and has a chime silence option with durable bronze bushing; creating a lovely environment in your home when you add this one of a kind New Haven Wall clock to your walls. 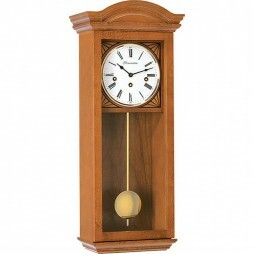 This is an elegant wall clock combines state of the art design and elegance all into one. This clock features a beautiful swan neck pediment and turned finial, and an ivory dial, that features a polished brass bezel. 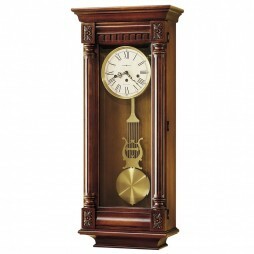 Decorative Roman numerals grace the clock with its beauty along with decorative hands that compliment the clocks features. It also has a Westminster chime movement and a silence option. 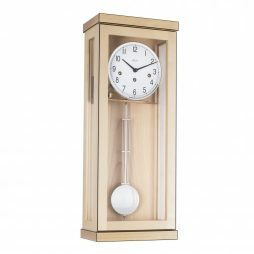 Upon buying this classic wall clock you will notice it's a polished brass pendulum that features a beautifully designed decorative grid. It's the perfect wall clock for any home or office. Digital devices may seem to have made life easier. 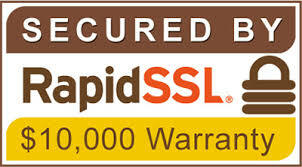 You have the Internet on your phone, consistently available at all times, from any location. You can make phone calls to friends and family from any screen, whether computer or television, and be able to engage with them firsthand as though they were in the room (even when they may be countries away). And, in relation to our line of work, digital clocks have become a dime a dozen, easy to find and completely affordable for your convenience. Technology has taken us far in life. However, all of these things have one flaw: the need for a power source. When power outages knock out your electricity, you’ve lost all charging ability for these devices. Or if the batteries give out, you’re left with a clock suspended in time until you exchange the batteries for new ones. Unfortunately, all of our technological blessings do become useless at times. Wouldn’t you feel more safe and secure knowing you have a time source that’s proven not to fail, as long as it’s maintained? 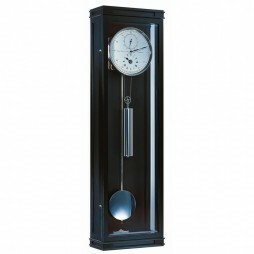 Get yourself a mechanical or keywound wall clock from ClockShops.com, and give yourself the peace of mind you seek in all aspects of your life. Clockmaking is its own form of art. It’s been constantly improved upon and aesthetically-enhanced through the years, leaving our generation with some gorgeously-designed and expertly-crafted clocks and timepieces. 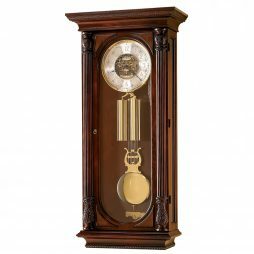 And here at Expressions of Time, we honor the clockmakers of the past and present by offering our customers some of the best items, from reputable brands all over the world. 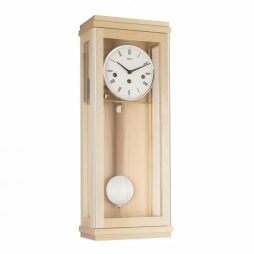 Our collection of mechanical wall clocks and keywound wall clocks show just how dedicated we are to understanding our craft, acknowledging some of the earliest stages of clockmaking. In fact, the word “horologia,” Greek for “to tell the hour,” is often used to describe early mechanical clocks. But the word clock (derived from the Celtic words clocca and clogan, which mean “bell”), has generally taken over the former terminology, implying that the sound of bells was a major characterization in the first prototypes for mechanical clocks, dating back to 13th century Europe. The power source of mechanical clocks derives from on a suspended weight on a cord, or a simple chain intricately wound around a pulley, sprocket or drum. However, the most widely-used mechanism is a spiral spring, also known as a mainspring. Mechanical clocks thus must be wound by hand over certain periods of time, using either a knob or key that inevitably stores energy in the weight/spring to keep the clock running smoothly. In this way, mechanical clocks may seem like a hassle. But think about it: having the ability to control your clocks without worrying about power outages, or dead batteries, should leave you feeling more relaxed than stressed. 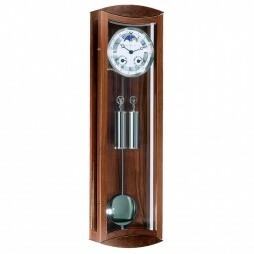 Not being tied down to shoddy electricity or forcing yourself to keep a constant stock of batteries in the house certainly makes up for the few, short periods of time it takes to wind up mechanical wall clocks and key wound wall clocks. 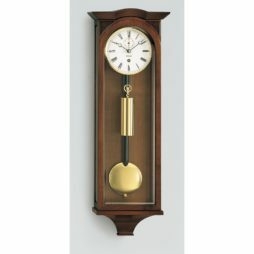 And lucky for you, ClockShops.com has a vast inventory of mechanical and keywound wall clocks, prepared to enhance any room of your home. 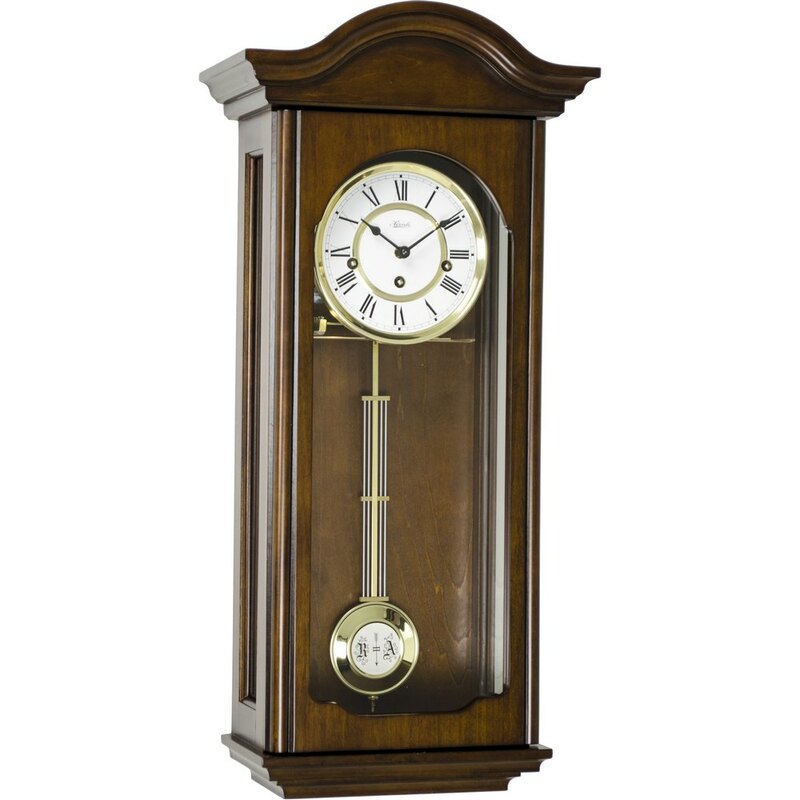 Accentuate the beauty of your dwelling with a piece that’s nothing short of stunning, like the Kieninger Palladio 31-Day Mechanical Wall Clock, with a walnut finish. This oversized, magnificent piece could be considered a work of art. It has a sophisticated and regal look, suitable for the home or office of any career-minded individual who wants to display their hard-earned rewards. 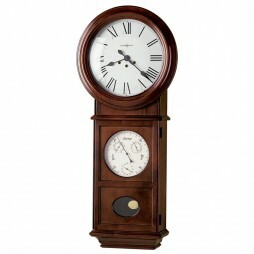 Or, if a mahogany finish is more in league with your style, try the Hermle Dartmouth 8-day Cable-Driven Mechanical Wall Clock. Its grace and elegance will stop you in your tracks, as the curled veneers, beveled glass and inlays call out to be seen. Want something with ornate style that sets your style apart from any other? Pick up the Rombach und Haas Bamberg Mechanical Wall Clock. This intricately-patterned gem is a sight to behold, made of sheets of linden wood in a filigree pattern you won’t find anywhere else. 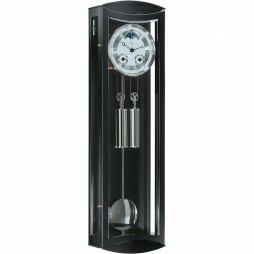 And its pendulum ensures a ringing bell on the hour or every half hour, depending on your preference. 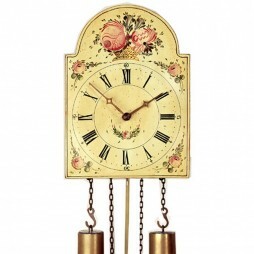 Its melodious chiming only makes this mechanical clock even more impressive. 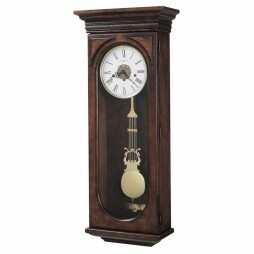 Or present someone with this precious gift: The Shield Black Forest Painted Dial Antique Reproduction Clock. These vintage keywound wall clocks are hand-painted with floral designs, so each item is its own individual work of art. And this keywound wall clock will last a full eight days, ringing once every hour with its large, coil gong. No matter what kind of mechanical wall clock or keywound wall clock you’re looking for, Expressions of Time is bound to have something you’ll positively adore. Keep your home warm and inviting. Adorn your walls with some elegant pieces that give your living space that extra bit of personality and charm. From seemingly effortless craftsmanship to harmonious, ringing bells that soothe your soul, our mechanical wall clocks are a must for anyone looking to break free of overbearing technology. Expressions of Time is devoted to offering excellent customer service and affordable rates, even on our finest of products. With free shipping available to most of the continental U.S. and our 60-day return policy, you’ll never feel swindled or misled by our services. 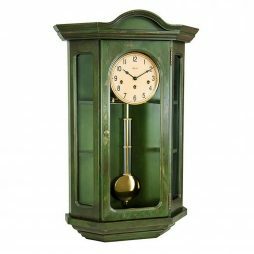 Check out ClockShops.com today and peruse our highest quality items. You don’t wanna miss out!